What's the link between cosmic rays and climate change? Cosmic ray counts have increased over the past 50 years, so if they do influence global temperatures, they are having a cooling effect. The galactic cosmic ray (GCR) warming hypothesis is based on the premise that GCRs can "seed" clouds, and clouds reflect sunilight. So if there are fewer GCRs reaching Earth (because a strong solar magnetic field is deflecting them away), the hypothesis says there will be fewer clouds, more sunlight reaching the Earth's surface, and thus more global warming. On the contrary, while GCRs are up, global temperatures are also way up, and temperatures in recent years reached record highs. Annual average GCR counts per minute (blue - note that numbers decrease going up the left vertical axis, because lower GCRs should mean higher temperatures) from the Neutron Monitor Database vs. annual average global surface temperature (red, right vertical axis) from NOAA NCDC, both with second order polynomial fits. What about the last 10 years of global not warming? Why does CO2 get an 800 year wrong direction lag and the sun has to be exactly in step to be a viable hypothesis? Response: The point is that because the sun has correlated so closely with temperature in the past, when the correlation ended in the 1970's, it's reasonable to conclude some other forcing imposed itself on the climate. Re the CO2 lag, the ice core records actually confirm the amplifying effect of atmospheric CO2. As for the last 10 years of global not warming, you'll find the warming rate is the same over the last 10 years as over the last 30 years. "...Furthermore, during sudden transient reductions in cosmic rays (e.g. Forbush events), simultaneous decreases occur in the diffuse fraction, showing that the diffuse radiation changes are unambiguously due to cosmic rays." Hence, it is pointless to argue that cosmic rays do not affect cloudiness. The correlation is there on a timescale of hours to decades, and as others have shown, on centennial to billion of years. The mechanism might not be what Svensmark has proposed but it doesn't change the basic fact if he is wrong about that. Secondly, your argument is nonsensical, as what Svensmark and other argue is not that cosmic rays can account for all climate influences. But if he is right - and evidence is piling up that he is - two things follows. 1) the parametrisation in current GCMs are wrong as they fit past temperatures without taking this effect in consideration. Hence they are not reliable as tools for forecasts. 2) climate sensitivity is overestimated by earlier attempts such as Hansens, as one major forcing was not considered when calculating those sensitivity values. What "sceptics" such as me claim is that there is precious little evidence to support the higher estimates on future temperatures as presented by UN (IPCC). And quite a bit of evidence against it. Emission scenarios is, well, rather extravagant, as they include projections of emissions many times higher than todays in year 2100 in spite of our likelhood to develop good alternatives to the ever more pricier fossile fuel (current trends are cutting the cost of renewables at half each decade). Climate scenarios based on these extravagant emission scenarios is then calculated with GCMs that are likely overestimating the response to a particular forcing. In general I would say sceptics accept that the climate warms when we add CO2 to the atmosphere, but we believe its effect will be muted by the climate systems rather than enhanced. I also want to add that I recognise all other environmental (and geopolitical) problems associated with burning fossile fuel and find that a compelling reason to put higher efforts in developing alternatives. "The point is that because the sun has correlated so closely with temperature in the past, when the correlation ended in the 1970's, it's reasonable to conclude some other forcing imposed itself on the climate. Re the CO2 lag, the ice core records actually confirm the amplifying effect of atmospheric CO2. As for the last 10 years of global not warming, you'll find the warming rate is the same over the last 10 years as over the last 30 years." For sure, neither the sun nor CO2 nor the two together make up for the only climate forcing. So your argument is a bit weak by itself, but even if we assume that all the unexplained difference is due to CO2, that doesn't give as much room for IPCCs +6°C forecast that you seem to imply. If all the difference from Krivova et al graph is attributed to CO2 that means that burning half of our known reserves of oil and gas has yielded us less than 0,3°C in temperature change. Some may be in the pipeline but several degrees? The climatic response time would need to be many hundreds of years for that to be possible, which clearly is not the case with TSI & cosmic ray forcings. I would also think that the discussion would be less confusing if we started to define what kind of cosmic rays we are discussing. If I remember correctly Laut is using low energy CR but what Svensmark and others claim is that it is cosmic rays of a certain energy (around 10 GeV) that makes the difference: only these energies create the secondary particles needed for the ionisation over low altitudes far from land. Sometimes the CR of high and low energies follow eachother, other times they won't; hence we should clearly state what kind of cosmic rays we are refering to. GCRs are certainly a fascinating aspect of climate. It is suggested that high level cloud formation is not affected because of the differences between ice crystals (high level)and vapour ( low level). http://www.solarstorms.org/CloudCover.html cosmic ray/low cloud cover. "The correlation of low cloud factor and cosmic ray flux is unexpected as the maximum degree of ionization by cosmic rays occurs in the altitude range 12-15km, i.e. close to or above the tropopause. The altitude ranges covered by clouds of different type are: 0-3.2 km for the low clouds, 3.2-6.5 km for the mid-level clouds and 6.5-16 km for the high clouds. Thus any cosmic ray induced cloud effect would be expected to be stronger for high rather than low cloud layers (Kernthaler et al. 1999; Jorgensen and Hansen, 2000). An explanation may lie in the fact that, as the neutron detectors are located at ground level, the measured flux is more representative of lower than higher regions of the atmosphere. Also, we suspect that the physical state of the cloud droplets may play a significant role in the cosmic ray-cloud interaction. It has been pointed out before that the physics of ice and liquid clouds may differ (Gierens and Ponater, 1999). By analysing different low cloud types separately we found that clouds in a liquid phase account for almost all the variability during the observed period, leaving the ice clouds constant in time, except at the poles where a slight increasing trend for some of the ice cloud types is found. Thus the greater sensitivity of low cloud to cosmic rays may result from the preponderance of liquid phase cloud types at lower altitudes (less than 6-7 km). " A thought: cosmic rays are essentially protons, alpha and beta particles (90%,9%,1%) and since it is well known that both alpha and beta particles cause condensation trails in cloud chambers thro' ionisation, does it not follow that in appropriate atmospheric conditions they would cause condensation nuclei to form? And that the extent of such formation would depend on the quantity and energy levels of these particles? Also, is the ratio of particles always the same or is there variation which would allow for increased/decreased cloud formation regardless of the overall level of CR's? The point is how much heat arrives on the surface of the earth for what duration. If you leave water in a pot on the stove, and do with the the heat control a mock-up of the suns behaviour over the past 1100 years, the water will get hottest when you turn the heat up and leave it up. The water will not get hot hot when you give irregular bursts of heat, then turn it down again, or no heat. That temperatures continue to rise when sunspots level off is analogous to the water continuing to heat when you leave the stove turned on. Perhaps a pig on a spit might be a sizzling analogy for some. Until our planet reaches the temperature of the surface of the sun as it would be at this solar radius, we are going to continue heating up. Hopefully, sunspots will drop off before then. The 'exact' set interacting mechanisms of cloud formation would be interesting to know, and must affect the amount of the suns energy arriving at what the oil-well-country-occupying military types refer to as 'ground zero', eh? I am sure the global warming denialists are going to climb onto the bandwagon that cosmic rays are found to influence tree ring growth - http://news.bbc.co.uk/earth/hi/earth_news/newsid_8311000/8311373.stm - and then try to tie that to proof that cosmic rays are responsible for climate change. "The bottom line is even if these difficulties can be resolved and the causality link between cosmic rays and cloud formation is proven, all they'll find is the cloud formation 50 years ago is similar to now and has had little to no impact on the last 30 years of long term global warming." Not so; as I posted somewhere else on this site there are 2 factors here - cosmic radiation and water vapour. If CR remains essentially the same you can still increase cloud formation if WV concentration increases. Temperature rises from CO2 increases are 'amplified' by increased WV according to AGW hypothesis - which is confirmed to be ocurring in the lower troposhere by direct measurement. Work by the Danes has shown that CR's act more like a catalyst in that single particles can cause many nucleation events, so the effect becomes SO2/WV dependant if CR level is constant. "Set loose by cosmic rays passing through the atmosphere, the electrons attach themselves to fragile clusters of sulphuric acid and water molecules. Their electric charges stabilize the clusters while more molecules join them. When the molecular clusters are big enough, the electrons can leave them in a stable state, and go off to encourage other clusters to grow. In other words, the electrons act as catalysts, which promote chemical action while remaining unchanged themselves. A single electron can make many attempts to grow clusters, even though it will fail if it leaves too soon. " Recently I watched a lecture by Dr. Richard Alley, at the AGU (link below). He mentions a "Muschler et al. 2005" paper, with a very neat graph showing a distinct spike in cosmic rays during the Laschamp event some 40 thousand years ago, with no corresponding change in temperature at the same time. I could not find the paper, though. Could anyone help? Mizimi, it doesn’t matter what the purported mechanism of GCRs’ effect is--water vapor, cloud formation, or anything else. Once the changes in GCR level stopped (i.e., GCR level became constant), the resulting energy imbalance of the Earth must “immediately” have started to shrink as the Earth “immediately” started to heat and therefore radiate more to match the new, now constant, level of GCR--regardless of whether the GCR effect occurs via some additional mechanisms involving water vapor, and regardless of whether the higher level of GCR amplifies the effect of increased water vapor. But the Earth’s energy imbalance has not been shrinking. It has continued to grow, which means the cause of the imbalance has continued to grow, which means the cause cannot still be GCR, because GCR has been constant for half a century. It is impossible for the effect to lag this long. This is the same reason the effect of solar radiance’s increase up to the 1950s cannot lag this long. The same argument applies to any factor once it stops changing. I try always to verify quotes from original sources in order to eliminate the possibility of misattribution. In this article, there is a quote referenced from a Max Planck article here: http://www.mps.mpg.de/dokumente/publikationen/solanki/r47.pdf (Krivova 2003). The quote is "between 1970 and 1985 the cosmic ray flux, although still behaving similarly to the temperature, in fact lags it and cannot be the cause of its rise. 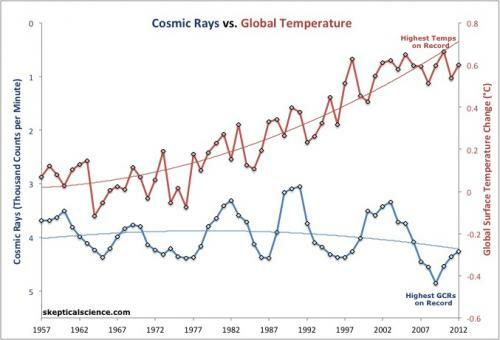 Thus changes in the cosmic ray flux cannot be responsible for more than 15% of the temperature increase". The above referenced .pdf file is a scan and is therefore not searchable for this quote. I have attempted to read the entire article (a daunting task for a non-scientist like myself) and cannot locate the referenced quote. A Google search finds only additional references to this .pdf and this article. Is the above quote actually in the referenced article? If so, I'm blind and didn't see it. If not, where does this quote come from? Response: The quote is on page 281 of that paper, beneath the graph I reference above. Thanks! I now see the quote (and will have my eyes checked). "Geomagnetic field intensity during the last 60,000 years based on 10Be and 36Cl from the Summit ice cores and 14C"
The graph looks pretty strinking to me. John, do you think it would be worth adding this to a future update on this argument? Response: [RH] Hot linked Musch paper. BTW hope you don't mind me asking here, but someone claims that the Twomey effect is wrong for dealing with clouds and that "Mie scattering" is more appropriate. Anyone know anything about this? there's something missing in the claim you're reporting. Twomey effect and Mie scattering are two different things. Riccardo, this is what he says,"Reportedly, the models significantly over-predict temperature rise for a given level of CO2 and have to be corrected by an assumed aerosol cooling from the 'Twomey Effect': the apparently greater brightness ['diffuse albedo'] of clouds with smaller droplets. Twomey's explanation, greater surface area gives greater 'reflectivity', is wrong physics but plausible: I saw it recently in NASA literature so it appears to be taught in climate science as if it were a fact. So, the satellites don't measure true albedo. The physicists know all about Mie scattering. One paper points out that there is no 'albedo' difference between southern and northern hemispheres when it is known that the aerosol concentration is much higher in the north." It isn't a subject I'm competent in, so I don't know if what he says makes sense. you friend is making some confusion between Mie scattering and Twomey Effect. The latter appears to be interpreted as the explanation of the dependece of clouds albedo on droplet size. I assume this is correct. 1) the total mass of water is kept constant, so smaller drops means larger concentration. 3) most of the clouds (low and medium level clouds) are optically thick and therefore single scattering aproximation breaks down. This means that the polar distribution of the scattered intensity varies only slowly, almost flat indeed. This contradicts the claim that "satellites don't measure true albedo". I'd like to add a few other comments on his claims. "models significantly over-predict temperature rise for a given level of CO2 and have to be corrected by an assumed aerosol cooling". Yes, if you give incorrect input to the models you'll get garbage for sure. Indeed, no one denies (i hope) that pollution from aerosol (sulfides in particular) has increased till roughly the '60s. Why the models should not consider this given that they do have an effect on climate? "One paper points out that there is no 'albedo' difference between southern and northern hemispheres when it is known that the aerosol concentration is much higher in the north." This is really a miopic point of view. Is albedo determined just by aerosol? No for sure. You have clouds, oceans, ice and several types of land. It is surprisingly enough that the mean albedo turns out to be almost equal in the two emisphere. Thanks Riccardo. BTW he's not a friend, just another blog scientist. I'm brand new to this forum and a bit intimidated by some very good-looking and well-researched science in these posts. I've been involved in cosmic ray research for several years and have followed the recent cosmic rays-cause-climate-change brouhaha with some skepticism. Perhaps I can clear up a few subtleties of the argument that seem important to this thread. First of all, its best to define terms: nearly all cosmic rays (CRs) detected at the surface of the earth are of solar origin, the result of collisions between primary particles (mostly protons in the solar wind) and nuclei in the upper atmosphere. The energy of these collisions throw off a chain of secondary particle interactions; what we routinely see are the muons and neutrons. On the other hand, the primary particles of Galactic Cosmic Rays (GCRs) are protons and heavier nuclei (up to Fe) from distant stars. At #3, there's a mention of CR energies and that only CRs of 10GeV or more produce secondary particles. Here is the standard chart of the CR energy spectrum, presented as measured particle flux vs. energy. Note that there are lots of 10 GeV CRs; what excites CR researchers these days are events around the "knee" -- 10^6 GeV or more. But it is well known that secondary particles (mostly muons) are generated by lower energy primary particles. We can even stop these muons with appropriate detectors. At #6, alpha particles don't get that far. As the decay scheme suggests, if any of these secondary particles are potential cloud-formers, betas (aka e- and e+) are the most likely culprits. At #12 there's a mention of GCR flux and the statement that GCR flux is now constant. This is where it gets complicated: during low periods in the solar cycle, we observe more GCRs. GCR flux is hardly constant. NASA recently found the GCR level to be 19% higher than previous records. This article proposes several mechanisms for this apparent paradox, not the least of which is the weakened solar magnetic field. The 10Be ice core data is mentioned in #15: for the last 500 years shown here, there seems to be about a 100 year cycle to 10Be peaks. Some of these peaks are coincident with low sunspot numbers (which is true of the 2009 GCR high-sunspot low). Problem is those peaks aren't very wide, so it seems that concluding much about causality or a 6 month lag or lead at this scale is a bit chicken and egg. Here's another science thread on this topic from last year. Finally, CERN's CLOUD project would be a controlled study of cloud formation by ionizing particles. No data yet. "Our results do not support the idea that the ions produced by galactic cosmic rays would be a major factor behind secondary aerosol production and the related aerosol-cloud interactions." Regarding Duplissy et al. 2010 Results from the CERN pilot CLOUD experiment on their preliminary results, please see this comment on a different thread and make any subsequent comments here. Response: Thanks for helping keep the threads organized! HR, the word would be laughable but, really, what is there to hang on in the Duplissy paper itself? What paper since Duplissy has been published using CLOUD data? References? Anything yielding more conclusive results? The point was not to reveal problems in the experimental design, but the problems were uncovered nevertheless. If those ultra clean walls can release vapors susceptible of corrupting the results, I don't even want to begin imagine what happens in the real atmosphere, where CCN are already present by the hundreds per cubic cm. Continuing from a comment on the Cloudy outlook thread. "high degree of blocking from local stratospheric warming from GCR spikes." I know a lot of people who are actively monitoring cosmic ray air showers of the type associated with GCRs; I don't see lots of evidence coming forth. These 'GCR spikes' do not last more than a few fractions of a second at most. And they do not necessarily come in 'swarms.' Big events can be years apart. Data have been obtained which suggest that changes in the Earth's electric field of 10–20 V/m occur close to the cores of extensive air showers initiated by primary particles of energy greater-than or equivalent to 10^17 eV. The earth's fair weather electric field is nominally 100-150 V/m near the surface, so this might be variation on the order of 10%. However, as one E field meter company states, "foul weather electric fields can reach values of well over 10,000 volts per meter at the ground". So why is anyone chasing cosmic rays? Climate change must be caused by lighting! #25 muoncounter, thanks for transferring my comment to a more appropriate thread. As I tried to explain in the other thread, I am not "chasing" anything, only mentioning a few of the causes of variations in sensitivity that are not in any paleo studies or current era models. Dana shows the non-match to 30 years of temperature in his threads and John shows recent non-match above as well. So the CO2 warming theory holds well for 30 years of precise GCR data and warming data. GCR is a much more variable effect both with clouds as above, and SSW http://www.appmath.columbia.edu/ssws/index.php and other effects. Those effects come and go and may balance out over time. They won't explain any inexorable monotonic warming or cooling because of their measured variability and because their effects are nonlinear and indirect through cloud and weather pattern changes. Events like SSW are modulated by solar activity but celestial in origin so their source is unpredictable but their intensity will be more or less diminished by higher solar activity. The most interesting aspect is the effect on climate sensitivity, not direct warming or cooling. A blocking event such as created by SSW or by other mechanisms will tend to diminish the water vapor feedback part of sensitivity. Another aligned effect is what Mizimi mentions in #10 above, that the water vapor feedback is diminished by CGR cloud formation. It is not an energy effect as correctly pointed out in #12, but it is an important change in sensitivity. A long term change in solar activity and thus GCR flux is a very important consideration in potential paleo and model analysis. Part of the higher sensitivity to CO2 warming measured in the late 20th century may be due to solar activity which diminished both the intensity of SSW events and the low clouds from GCR. Likewise part of the recent decrease in sensitivity may be be explained with solar activity decreases. This last paragraph is speculative, and I welcome critiques and counter evidence. http://arxiv.org/pdf/physics/0407005 and Kirkby et al say so. But what would be most interesting to me is to combine the orbital variation forcing (which is notably weak) with the GCR "sensitivity" modulation (see my post 26) to help explain rapid changes especially into ice ages. I put quotes around sensitivity since it is not the usual definition but a broader one in which any forcing (orbital solar or current CO2 increase) can be amplified or deamplified (or lowered forcing can also be amplified or deamplified). This may help explain some of the changes that are not explained by the orbital curves in the other thread, especially the initiation of warming and cooling since the GCR effects can be much more powerful (partly forcing as postulated in the paper, but also amplification of the weaker orbital forcing). scientists study all the reasonable hypothesis, it's their job afterall. Problem is when people take those hypothesis as valid alternative theories. Note that the paper, although submitted, didn't show up. Here you can find a nice review which includes the same data shown in the arxiv paper. Riccardo, thanks for the link. That paper is broad, not deep, but I agree with their conclusion that it is inconclusive especially without good GCR proxy data earlier than the present and 130k interglacials. What is a little weird about the paper is that they keep going back to solar and use GCR proxies as a solar proxy. Although GCR's are modulated by solar activity, they are their own animal. My guess looking at fig 8 is that an interglacial requires both low GCR plus northern hemisphere sun (the other thread), it can't happen with just one or the other. #29: "they keep going back to solar and use GCR proxies as a solar proxy." Because solar magnetic activity is what causes the observed variation in GCR frequency. Are you reading anything in this thread and following links that we provide? "Although GCR's are modulated by solar activity, they are their own animal." What animal? GCRs are infrequent and random; they come from times long ago and places far away. The only important feature of GCRs in this context is that they "are modulated by solar activity", which is what you questioned one sentence earlier in your comment #29! OK, so I looked at the website you linked, which is pretty nice. It would be interesting if you would try to match up the dates of their SSW events with anything else. However, there are fewer than 30 events in their entire database, which runs back to 1958. How much warming are we supposed to be getting from fewer than one event per year? I suppose if you pile up enough of these disparate straws, you will indeed be able to put together a modest-sized strawman. But it is stunning that one can cling to 'this might' and 'that could', when the answer, my friend, is blowing in the increasingly CO2-enriched wind (apologies to Mr. B. Dylan). Unless it is some preconceived idea that it just can't be CO2. In which case, you should be reading more here at SkS. muoncounter, the low frequency is a good point. I don't what the frequency history is, but likely it varies between zero and small. But it is not random since the galactic structure was not random over time and our transit through the galaxy does not take us into random amounts of leftover particles. It is quite unpredictable, although not completely unpredictable. They are modulated by solar activity and of course solar activity itself has other effects, so it is worth studying and using GCR as a proxy. But this thread is about cosmic rays and (my addition) the effect they could have on sensitivity. The fact of CO2 warming is not in question here (or at all), just sensitivity and I would greatly appreciate your opinion on my final sentence in #29. "For sure, neither the sun nor CO2 nor the two together make up for the only climate forcing. So your argument is a bit weak by itself, but even if we assume that all the unexplained difference is due to CO2, that doesn't give as much room for IPCCs +6°C forecast that you seem to imply." This is only true if there are no "tipping points" involved. However, if the current temperature rise is sufficient to bring trapped methane out of solution in the oceans, permafrost, clathrates etc, then there could be a feedback effect. Or there are other possibilities that could have the same effect. Here is a comment from Michael Benton, a paleontologist at Bristol University. He says that evidence points to the cause of the Permian extinction being prolonged and violent eruptions from the Siberian traps, a huge region of volcanic rock. In this scenario, mass eruptions triggered environmental catastrophe by belching an overwhelming quantity of gas into the atmosphere for half a million years. "The main follow on was a flash warming of the Earth. That caused stagnation in the oceans, as normal circulation shut down. On land, the consequence of all the carbon dioxide and other gases appears to have been massive acid rain that killed the forests and stripped the landscape bare," Benton said. "This was the greatest of all mass extinctions, the time when life was most nearly completely wiped out." Response: [muoncounter] Good points. See the discussions on methane hydrates here and here. This recent "The Register" article about a recently published paper on the influence of cosmic rays on climate presents a very different picture than the one shown here. I would be interested in seeing a assessment of the paper if anyone has time. #33: "a recently published paper"
Thanks for finding the appropriate thread. It appears that this is one from the 'here-we-go-again' department (I note that W^W# has already picked it up). I won't bother with snide editorialisms in the Register article or any of the other newspaper feeds that parrot it. Here is a link to the Rao paper (it's actually a 'research communication') to be published in the IAS publication 'Current Science'. d. He pulls a graph from a 2005 paper (Veizer) to show 'correlation' between surface neutron monitors and 'low-level cloud intensity'. Although this is supposed to be a heat-trapping mechanism and the conclusion of the 'paper' is that this is a significant part of global warming, he curiously omits any temperature data. e. He makes the usual hash of GCRs-> more high level clouds -> cooling due to increased albedo and GCRs->low level clouds -> warming due to heat trapping. Same old song, not even a new verse. pdt, I wouldn't get your information from sources like THE REGISTER. Having done a search for this 'paper', I have only found links to the usual sources of denial (like the one you found), most of them having copied a report from THE HINDU. In that original report, it states that Dr. Rao's findings were released "as a discussion paper" by the Indian Environment Minister. Another Indian source calls it a "scientific review...[of] recent studies..."
There is also a report in the HINDUSTAN TIMES, with a reaction from V Ramanathan of the SCRIPPS Institute. None of the reports I found, actually had a link to the paper or, even, any information about the title or where it was to be published. Seems like they were just interested in copying and pasting something that sounded to them like an anti-AGW paper. Strange, eh ? Doesn't appear to be that hoped-for 'final nail in the coffin of AGW' that some are hoping for (yet again). #36, I just read through that paper and I don't see a quantification of the low cloud changes. I don't think the author divided the TSI fluctuation by 4. His figure (2) comes from this paper http://www.sciencebits.com/files/articles/GACV32No1Veizer.pdf The Veizer paper references this paper http://www.agu.org/journals/ABS/2002/2002GL015474.shtml which states "Correlation of our total irradiance time series with T accounts statistically for 80% of the variance in global temperature over that period, although the irradiance variation amplitude is insufficient to influence global warming in present-day climate models." I'm skeptical about this last paper, correlations are suspect and I have not seen correlations of TSI and GAT. Thanks for the link to the Veizer 2005 paper; it certainly is unusual. He's mixed together what we've called GCRs with solar cosmic rays into a 'cosmic ray flux' (CRF). The CRF, in turn, is believed to correlate with the low altitude cloud cover. The postulated causation sequence is therefore: brighter sun ⇒ enhanced thermal flux + solar wind ⇒ muted CRF ⇒ less low-level clouds ⇒ lower albedo ⇒ warmer climate. Who among us will argue with the endpoints of that logical chain? Yes, brighter sun -> warmer climate. However, nothing in either Veizer or Rao substantiate the postulated mechanism of the steps in between. The 'its cosmic rays' crowd should be poised for a big couple of weeks. The recent solar flares (coronal mass ejections or CMEs) have arrived on earth, bringing "waves of ionization." More are coming, as the active far side of the sun rotates our way in the next week or two. See 19 Feb and 20 Feb spaceweather.com for a recap. "Global Temps should go up? (as middle height tropical clouds do not form droplets see svensmark). 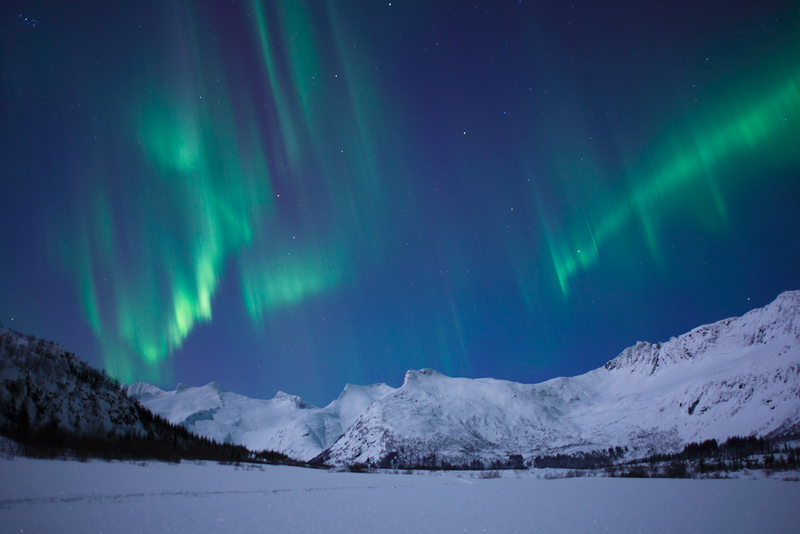 Interesting to record the time it takes…"
So far, some very nice auroral displays. Surface neutron monitors are unimpressed, example here, (approx a -4% change), which is not much compared to this 3x larger event from September 2005. Note these are links to dynamically generated images from the online neutron monitor at Oulu, Finland. These are known as Forbush decreases, as ionizing radiation shields the earth's surface from the normal CR flux. Yes, in another of nature's apparent paradoxes, a solar flare can decrease ground level cosmic ray counts. Which came first, the chicken or the egg? Can it be proven that the CO2 rose before the warming in the past or did it rise as a result of the warming of the oceans which then gave off the CO2? I have understood that the rising CO2 levels do not proceed the observed warming and actually lag it in most cases where tests are done with core samples etc. I keep an open mind myself. electroken - please see CO2 lag temperature for answer. This has nothing to do with cosmic rays. Short answer CO2 can be both forcing and feedback. A new study could heat up the discussion again, I think. (hope I got the link process right) on a recent though as yet non peer reviewed study by Svensmark. given that gcr count didn't change in the last 70 years or so, Spencer's hypothesis can not change the picture of the last decades. It might only have an effect before then, if any. THanks for that link Arch. The real problems with the GCR hypothesis are unresolved. The effect is weak at best, whatever particles are created are too small, and no possibility for a particle growth process has been put forth yet. Philippe - I was hoping you would notice this since we had this discussion on another thread a few weeks ago. "The results will be published shortly. I asked the colleague to make the results clear, however, not to interpret. This would go immediately into the highly political arena of the climate change debate. One has to be clear that it is the cosmic radiation is only one of many parameters." "Even if these difficulties can be resolved and the causality link between cosmic rays and cloud formation is proven, this would mean cosmic rays would have been imposing a cooling influence on climate over the last few decades." So for the sake of argument, let's say the latest CLOUD results find that "causality link." Why the "do not interpret" instruction from Heuer? What does it actually mean, in the context of scientific research and publication of results? The interview is awfully thin, and only touches on CLOUD for one very brief question. Refer to this post on RealClimate about some other recent, similar research. Basically, in order to build the GCR theory into something remotely respectable, they have to first create all of the building blocks that are similar to an understanding of greenhouse gas theory. In the case of GCR's, they need a precise mechanism, with all of the intermediate steps needed, to show how GCR's actually, mechanically affect cloud formation. Now, his one comment about not interpreting the results probably (I expect) speaks to the fact that the CERN research can only show some very small pieces of the puzzle. They need lots and lots of pieces to compile it into a workable, fully functioning GCR theory. So to over interpret any one step, in either direction, would be foolish. We will investigate the clustering of trace gas molecules onto ions. The trace gas molecules will either be formed by the ionising particle beam in pure artificial air or be introduced directly into the chamber. Aerosols of a well defined size and with typical atmospheric composition (NaCl, (NH4)2SO4, H2SO4) can be produced with standard aerosol generation techniques (Section 4.4.3). Experiments will be performed to examine the activation of these aerosols into cloud droplets. These experiments will first quantify the poorly-known production rates of a) nitric oxide (NO) and b) hydroxyl radicals (OH) by cosmic radiation. The former will involve pure artificial air and the latter will involve argon and water vapour. Subsequently we will investigate the effects of these vapours on the nucleation and growth of aerosols. These studies concern the formation of ice nuclei in supercooled vapours at low temperatures. The expansion chamber will be used to create a supercooled cloud by expansion and growth of drops at temperatures below 260 K. ... In addition to experiments with supercooled liquid droplets already present(freezing nucleation),we will also investigate ice nucleation without pre-existing droplets(deposition nucleation). These experiments concern the deposition nucleation of nitric acid and water vapours onto ion clusters to form nitric acid hydrates. Particles composed of such hydrates are thought to be the principal component of the polar stratospheric clouds that initiate the destruction of ozone. So, in a nutshell, nothing earth shattering in any direction can come from current CLOUD experiments. They are necessary first baby steps to creating a plausibly complete GCR theory (which in and of itself shows how sicence-fictiony the theory is at its current stage). Which means, in a nutshell, that the deniers are getting their undies all in a bunch over nothing, just because they love to cry wolf conspiracy.